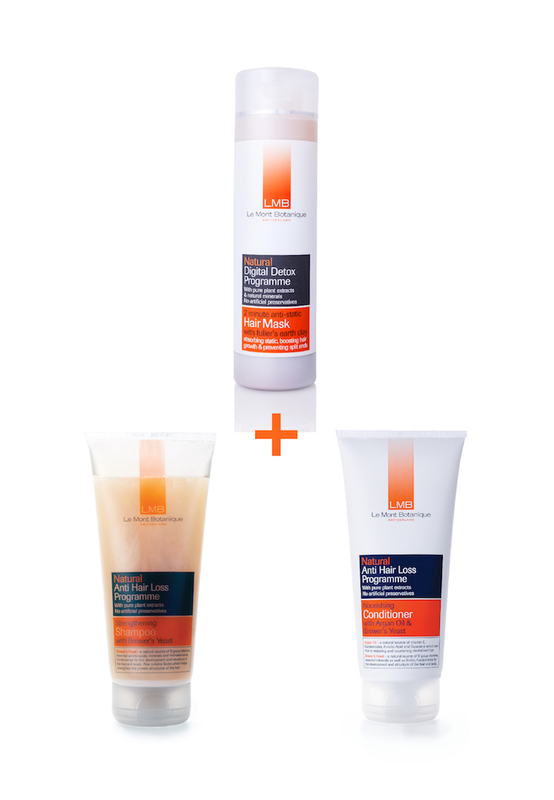 For thinning hair, combine a digital detox mask with LMB's Anti Hair-Loss Shampoo and Conditioner. Making hair thick, healthy and shiny. LMB Strengthening Shampoo is fortified with Brewer’s Yeast and pure Argan Oil, Arnica, Nettle and Caffeine extracts to help reduce hair shedding and promote fast, healthy growth and lustre. Gentle cleaning action with a rich lather for tangle free, full-bodied hair. Hair Mask: Shake well before each use. Wet hair with warm water and gently massage the mask into the hair and scalp. Leave for minimum two minutes and rinse well. Use twice a week in place of LMB's anti hair-loss strengthening shampoo for lasting results. Shampoo: Wet hair with warm water. Gently massage shampoo into hair and scalp. Rinse well. Conditioner: Wash hair with LMB's strengthening shampoo or 2 minute anti static hair mask. Massage conditioner into wet hair. Leave in for 2-3 minutes and rinse with warm water. Use daily for lasting results.